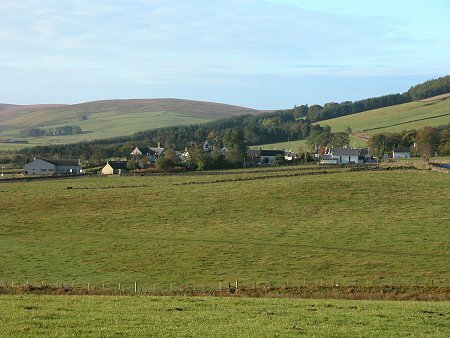 The history of Crawfordjohn, in the upper ward of Lanarkshire, dates back many centuries with reference being made in charters of Wice during the time when Bishop Herbert held the See of Glasgow, 1147-64, and in the reign of King Malcolm, 1153-65. In 1260, Henry, Lord of Wyston, confirmed to the Abbey of Kelso the advowson of the church, and in the rental of the abbey about the year 1300 an amount appears under the name of Crawfordjohn. Records show that a rector was in residence in 1450 by the name of Robert de Glendonwyn and various parish and presbytery records exist to tell the tale of numerous on goings within the parish. One such dispute was between heritors of the various parishes in the upper ward and the presbytery about the practice of burying within the church, while the clergy wanted to prohibit this. Through recorded history of Crawfordjohn, it has had many owners or lairds including: John de Crawford, Sir Reginald de Crawford, Thomas de Moravia, David de Barclay. Moravia was the second son of Chritian, the sister of Robert Bruce, latterly Lord Bothwell. Moving through the centuries the barony having been previously split between families was reunited into one by James, second Marquis of Hamilton in 1611, and remained in this ducal house until 1693 when it was conveyed to the Marquis of Linlithgow (a younger son of the house), here again it remained until late in 1700’s, when it was sold along with the neighbouring barony of Crawford to Sir George Colebrooke, Bart. The Colebrooke family retaining ownership of the barony and lands until the early 1900’s where upon the estate was put up for sale and gradually disposed of (a copy of the sale brochure is held by the museum).